Despite an incredible screen and strong battery life, if you’re not able to make liberal use of Samsung’s phone-exclusive syncing and biometric login features via Samsung Flow, there aren’t many compelling reasons to pick up the Galaxy Book over similarly-priced competitors. Samsung has been working hard on perfecting the 2-in-1 device, and with the Samsung Galaxy Book it has made its best convertible yet, surpassing its own Galaxy TabPro S of last year. To be honest, the Galaxy Book, doesn’t do a ton different from the Windows tablet that preceded it, but rather refines it with some marked improvements, namely a far better keyboard cover than before. However, what Samsung’s tablet needed wasn’t improvements on the current design so much as perhaps a different design altogether. Furthermore, for every improvement made here, there seems to be an almost equal detraction. The result is a Windows tablet that’s just fine in construction and performance, but one that continues to lag behind rivals. What does make this 2-in-1 device more tempting, however, is the fact that since its launch there have been some pretty decent deals that have cut the asking price for the Samsung Galaxy Book. This means, if you're weren't completely sold on the Galaxy Book at its launch price, the new lower price tag may be enough to make you purchase this convertible. Samsung sees itself in a tough position regarding how it’s priced the Galaxy Book. While it comes in both 10.6- and- 12-inch varieties, the more widely comparable 12-incher starts at $1,129 (about £867, AU$1,510). That price gets you a Windows 10 tablet housing an Intel Core i5 processor (Kaby Lake), 4GB of memory, and a 128GB solid-state drive (SSD) behind a gorgeous Super AMOLED touchscreen at 2,160 x 1,440 resolution, and with an S-Pen stylus and keyboard cover included. For reference, a similarly-specced Microsoft Surface Pro 4 (with a keyboard cover included) can be had for nearly $200 less via Amazon on sale in the US, as of this writing. 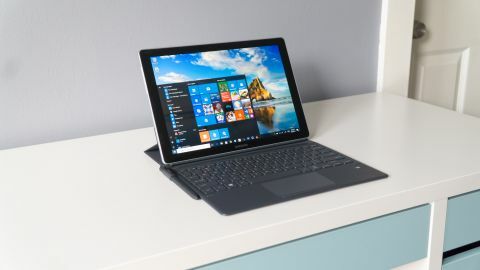 Granted, the SP4 offers a dated processor, though it also houses a sharper screen, more port variety and Windows Hello support natively – face recognition through its infrared (IR) camera – where the Samsung option requires a Galaxy phone connected via a Samsung Flow app. If you want a 10-inch version of the Galaxy Book, with a TFT touch panel instead of that Super AMOLED display, you’ll have to pay $629 (about £480, AU$800) for 4GB of memory and 64GB of SSD storage powered by an Intel Core m3 processor (Kaby Lake) behind a 1,920 x 1,280 touchscreen. For reference, the entry-level Surface Pro 4 goes for just over $100 more on Amazon in the US, doubling the Galaxy Book’s storage but lacking an included keyboard cover. Both the 10-inch and 12-inch models can have their storage doubled for another $100 and $200, respectively, though the latter also gets double the RAM (8GB) for that price. A 12-inch model with an LTE radio powered by Verizon with 4GB of RAM and 128GB of storage is also available for $1,299 in the US. The problem here with the Galaxy Book price is that its materials don’t exactly scream worthiness of such an entry fee. For instance, while the build quality on display is impressive, the tablet comes in a plastic frame. Yes, you’re looking at a $1,000-plus tablet inside a plastic shell. Granted the plastic feels plenty sturdy and smooth, giving off the illusion of aluminum from a distance. The Galaxy Book employs curved edges all around its body, giving the feeling that this is a tablet first and a laptop second. These two points remind us of Samsung’s previous Windows 10 tablet, the Galaxy TabPro S, though that device housed magnesium sides and a plastic back. Speaking of which, the Galaxy Book tacks on four-tenths of an inch more than its predecessor at 0.29 inches thin. Rounding out what the Galaxy Book looks and feels like, Samsung outfitted the Galaxy with all sorts of tablet niceties, like a top-oriented power button and volume rocker, and a rear-facing, 13 megapixel (MP) camera that no one will (or shouldn’t) use. Though, its front-facing, 5MP webcam is not infrared and therefore does not offer secure Windows Hello login. Of course, the Galaxy Book comes with an S-Pen stylus – it's first time featured on a computing device – and backlit keyboard cover included in the price, neither of which require charging whatsoever. The former of which doesn’t offer much function beyond drawing, with nothing but a simple button that activates a secondary function, usually erasing in most drawing apps. The stylus is awfully light, as a result, and is pleasantly difficult to lose with Samsung’s included pen loop. The loop holds the matte gray plastic pen snugly, and has its own dedicated spot on the included keyboard cover to be attached to with a strong adhesive that’s already on the loop. We appreciate Samsung’s valiant mission to get its take on the keyboard cover working for 12-inch devices, but it’s time to give up the ghost. There’s nothing wrong with the keyboard’s feedback and travel depth – both are quite enjoyable, actually. It’s that firstly, the keyboard lays completely flat when using the device as a laptop, which isn’t very comfortable; secondly, typing with the device on your lap often feels as if the device is going to spill right out and finally, figuring out the keyboard cover’s various magnetized orientations feels like making origami to get it aligned with the tablet’s several magnets correctly. In short, this is a keyboard cover design that isn’t conducive to many forms of work, yet at the same time is essential to using the Galaxy Book in those very scenarios. This is because Samsung still wants the keyboard cover to act as the device’s kickstand. Frankly, as we’ve seen from other device makers before (including Samsung), it doesn’t work out so well. That said, the keyboard cover’s soft-touch plastic feels quite comfy to at least rest your palms on, while it offers up little to no flex when bent – a fine sign of sturdiness.